With the winter season almost at the halfway point, athletes are putting their focus on helping their teams qualify for the postseason. Berlin’s Angela Perrelli and Southington’s Andrew Lohneiss have both helped their respective teams get the win this past week in hopes for their teams to qualify soon. The Berlin girls basketball team picked up two important wins last week, first beating Windsor last Tuesday 47-32 and then beating Middletown 57-50 on Thursday. And while the Redcoats got plenty of quality performances along the way from a number of players, it was Perrelli who made the difference in the comeback win over the Blue Dragons. The junior guard took over the game against Middletown in the fourth quarter, scoring 13 of her team-high 18 points to erase 10-point deficit in the victory. But despite her strong showing, the Berlin captain was quick to highlight the play of her teammates. But Perrelli has been more than just a standout for the one game. She has done so through the first half of the season, averaging 12 points and three steals a game. She has also proven to be just as effective off the court as on it. “She’s having a very good season,” Berlin head coach Sheila King said. “We’ve been battling through quite a difficult schedule this season and we’ve lost very close games along the way. We’re a very young team and with that comes some learning experiences. But Angela has shown tremendous leadership with the younger kids. She’s demonstrated some great leadership skills. She’s one of the hardest workers in practice on a daily basis and leads by example. She always has positive comments for the younger players, just a very strong leader. The Southington boys basketball team sets itself up to qualify for the Division III tournament entering the week. Needing eight wins to qualify, the Blue Knights moved to 7-2 at the end of last week after picking up wins over Newington (55-42) Tuesday evening and Northwest Catholic (53-47) on Friday. Lohneiss’ play was particularly important against the Indians as the senior guard scored a total of 21 points Tuesday evening. “He’s been tremendous on the offensive side of the floor,” Southington head coach John Cessario said. “What he definitely is, is a competitor. For someone that didn’t play a lot of youth basketball, structured youth basketball, he’s a self-made-player, who has bought into what it is we’re trying to do. Lohneiss was even recognized by the other team as they had trouble shutting him down. Although Lohneiss fueled the Blue Knights, there were still things that Southington has to work on if they want to keep winning. “We started the first quarter really off,” Lohneiss said. “The defense wasn’t really there. We weren’t stopping them. We were letting them rip down the middle, it just wasn't good defensively. Second quarter, we picked it up and I think we ran a lot better, fueling our offense. 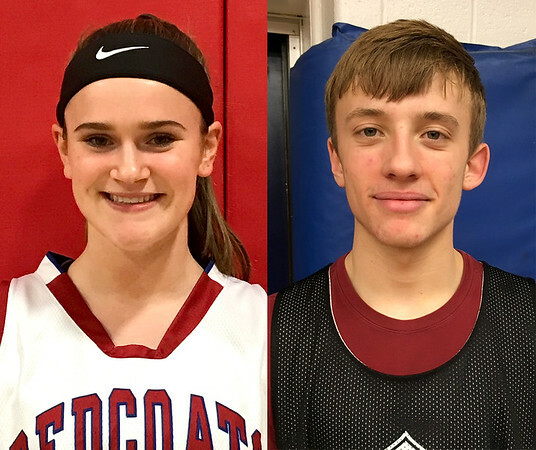 Posted in New Britain Herald, Athletes of the Week, Berlin, Southington on Monday, 22 January 2018 23:00. Updated: Monday, 22 January 2018 23:02.